One of the first workshops we ever talked about here on the blog was a with our good friend Jane from Tea and Crafting, who we have been back to visit more than a few times. Loom Knitting is a little similar to knitting on a dolly or french knitting you may have done as a child, but it is on a long loom rather than a small round one. Our H has made many Christmas and birthday gifts with the skills learnt at this workshop, all gratefully received! We have also learned Machine Embroidery with our friend Nicky and Rag Rugging with the beautiful Elspeth at Tea and Craftings venue in Camden. It is a lovely space to learn, and there are so many classes to choose from it's hard to know what to choose what to learn next! Another place we have visited a few times is the Makery in Bath, we haven't done a workshop at their Bath venue, but we did get the tour of their amazing studio and shop last time we were there. We have done a workshop with them at John Lewis in London though. Last summer we learnt how to make Espadrilles which was such a fun afternoon, and we got a pair of shoes out of the class too! Something a bit different for both of us was our evening at the Biscuiteers when we learnt how to ice biscuits at their icing cafe. It was so much fun and something that we have both done again since with our gingerbread creations. Right back up my street was Hand Embroidering Handkerchiefs and visiting our friend Inma at The Old School Club. Another lovely venue with a very wide range of workshops on offer, as well as a bunch of classes for kids as well as adults. The last one I want to look back on today was H's trip to Quill to take a Modern Calligraphy Workshop. We were both lucky enough to get another go at it recently when we were at the Mollie Makes Awards which was brilliant as I got a chance to get some pointers myself. If you want to check out more of our adventures from the last five years check out our Live it page with links to all our trips and events since we started blogging. I hope that has inspired you to head out and book yourself on some classes near you. The things you get to make in the classes make awesome Christmas gifts, and you get to keep the skills you learnt! Win win! 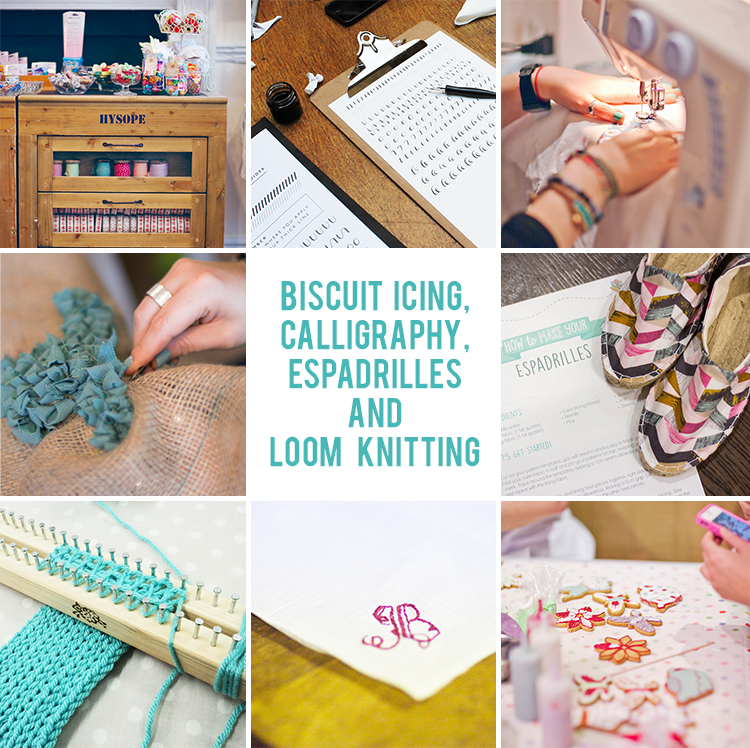 Don't forget you can find out about classes and venues in your area with sites like Craft Candy and the Sewing Directory to name but two.